"This cake is heavy without being dry; everyone in my family loves it, and visitors do too!" Preheat oven to 350 degrees F (175 degrees C). Lightly grease and flour a Bundt or angel food cake pan. Pour the poppy seeds into the buttermilk in a small bowl. Set aside to soak for 15 minutes. Meanwhile, whip the egg whites to medium peaks; set aside. Cream together the butter and sugar in a large bowl until fluffy. Add egg yolks one at a time, blending well between additions. Sift the flour, baking soda, and baking powder into the egg mixture; fold gently to mix. Stir in the poppy seeds, milk, and vanilla extract. Gently fold in the beaten egg whites until just incorporated. Pour half of the batter into the prepared pan. Sprinkle in the chocolate chips and cinnamon sugar. Pour the remaining batter over top, and sprinkle with additional cinnamon sugar. 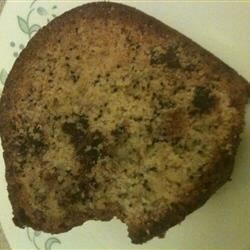 With a knife, lightly swirl in the chocolate chips and cinnamon sugar so they are dispersed throughout the cake. Bake in preheated oven until a toothpick inserted into the center comes out clean, about 1 hour. Allow cake to cool completely before removing from the pan. This is a very good cake!! Nice and moist.